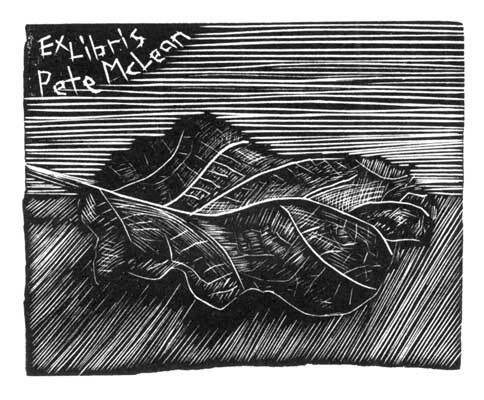 This week saw another long thought-of project finally enacted ; making myself a bookplate, also known as an ex libris. Bookplates are small printed labels used to claim ownership of ones books. They have a long history and have been made by commercial publishing houses and prominent artists alike. 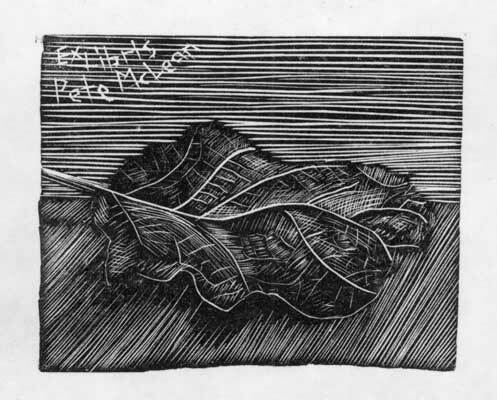 I started this small engraving this week during a class I was teaching at Megalo Print Studio. It wasn’t initially planned as an ex libris, but for somewhat unknown reasons, I left a dark corner. After proofing, I didn’t like the dark corner and was about to extend the horizontal lines and realised this could be the perfect opportunity to turn it into a bookplate. I was still a little concerned that black corner was a little clunky. After printing a whole bunch of them on Megalo’s lovely Albion Press, I did then extend the lines, and print a bunch of those as well. While creating and printing the bookplates was fun, the real satisfaction was pasting them into my books today – at least those that I have with me at the moment, which are mostly teaching resources and a few books I’ve been reading recently. 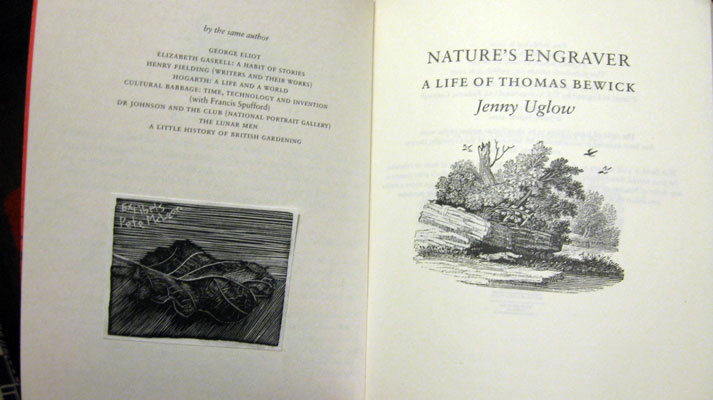 One such book to receive its new bookplate today was Jenny Uglow’s biography of Thomas Bewick – himself a prolific creator of bookplates. It’s nice to feel I am continuing a tradition that is a little on the wane. 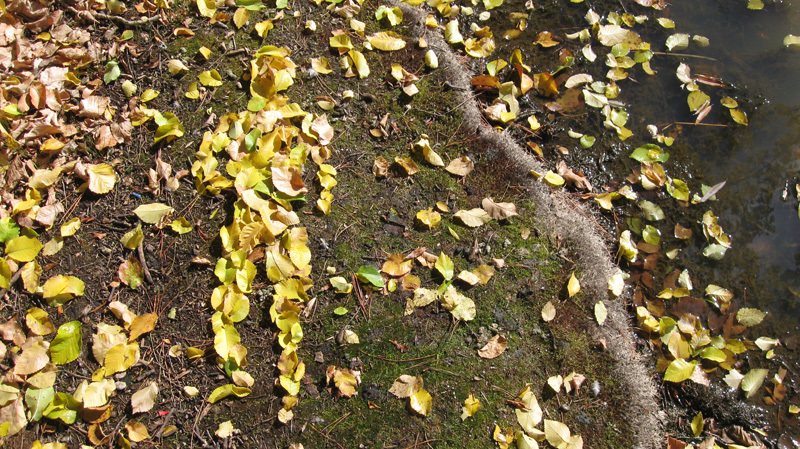 It’s been a beautiful autumn in Canberra and this day was one of the best, so I had a ride around the lake, got mesmerized by the glowing Beech trees, and made a little leaf man in a quiet spot by the lake. I mentioned in the last post that I used the cut-out stencil to aid in the making of a wall piece. 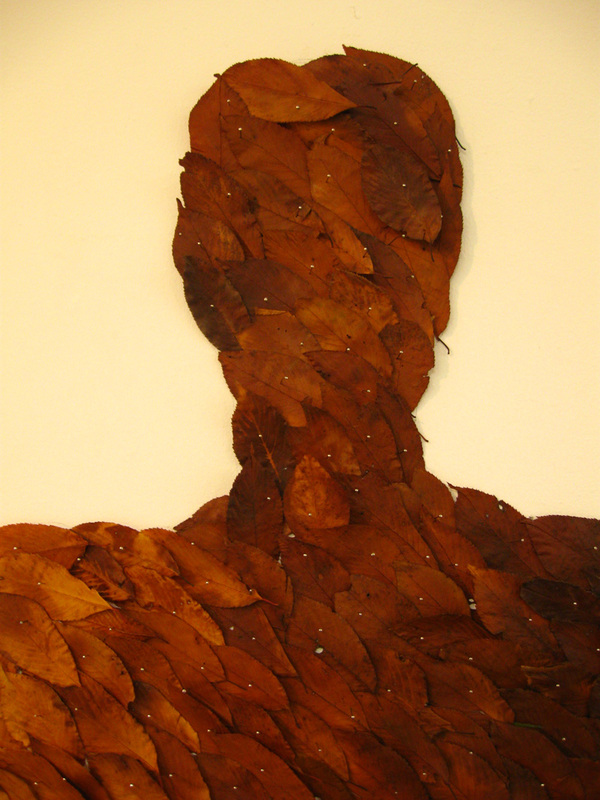 Below are a couple of pics of the piece, a disintergrating man, made from cherry tree leaves pinned to the gallery wall. It was shown at M16 Gallery as part of ‘Light Industrial’, a show that resulted from a series of community arts workshops that focused on the industrial site where the gallery and studio complex is located. While it is mostly bitumen and sheds, an old weeping ornatmental cherry tree opposite the main door gives a touch of something growing. 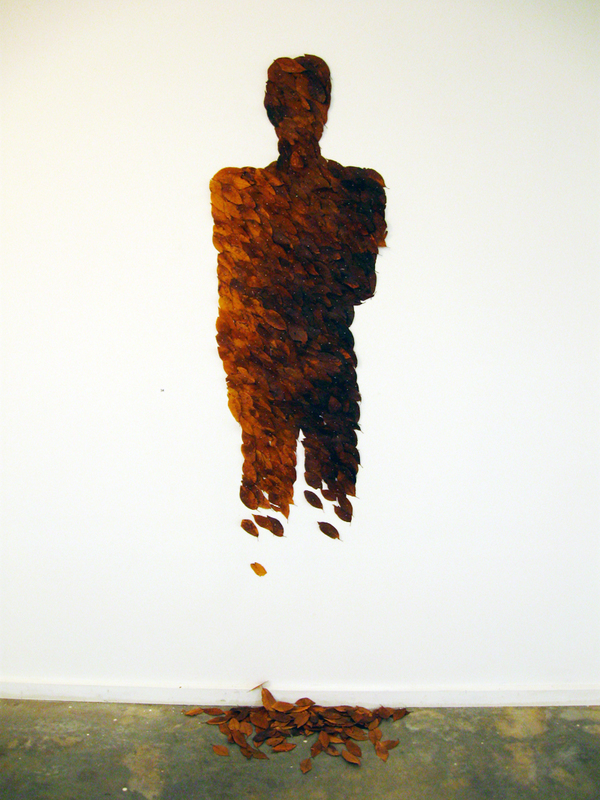 Untitled, Peter McLean, 2009, leaves and pins, detail. Untitled, Peter McLean, 2009. Leaves and pins. The exhibition was held in the winter, but I had already collected a lot leaves from beneath the cherry tree in the autumn and dried and pressed them so despite being on the gallery wall for several weeks they were quite stable. There was a powerful dried leaf smell when you were up close to the work too. It was quite different seeing this type of ppiece on the wall instead of on the ground as I had made them before. Also, although the work was still temporary, it was not exposed to the elements and prone to blowing apart at any moment like the pieces on the ground. That’s why I decided I needed to contrive the sense of the image disolving from the base, where I had been making the outdoor work with a complete figure. I’ve been unable to resist doing some leaf works lately, and they have all been circles. A circle marks a spot, and it also creates an inside and an outside, like a Venn diagram, but with only one set. I’m not sure yet what this means in terms of why I am making leaf circles, but I am sure it is relevent somehow! The occupation of space perhaps. I wanted to use the white leaves (pubescent undersides) because I was a little bit perplexed as to why only some of the leaves were white underneath, only about 10% or less. They all came from the same tree. 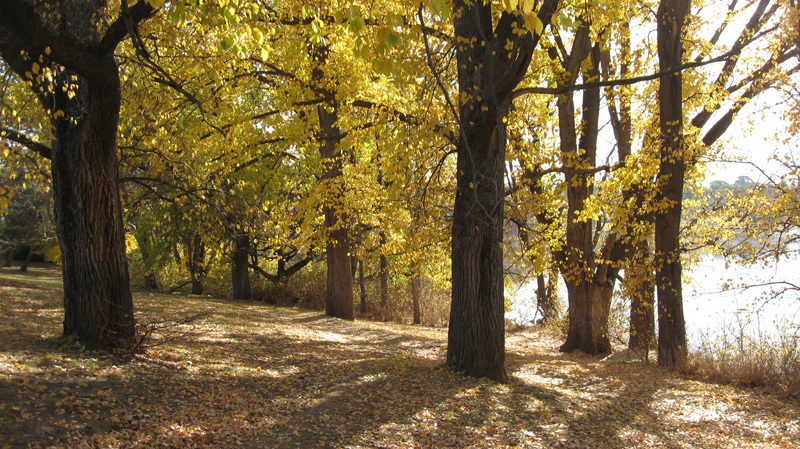 While the whiteness does wear off over time after the leaves have fallen, but this is only a partial explanation, since even when looking at just the ‘freasher’ yellow leaves, most are smooth underneath (and therefore not white). This last one is only a half circle of course, but conceptually continues beyond the paving to circle the large tree on the left where the leaves came from. I did it early in the morning at school. 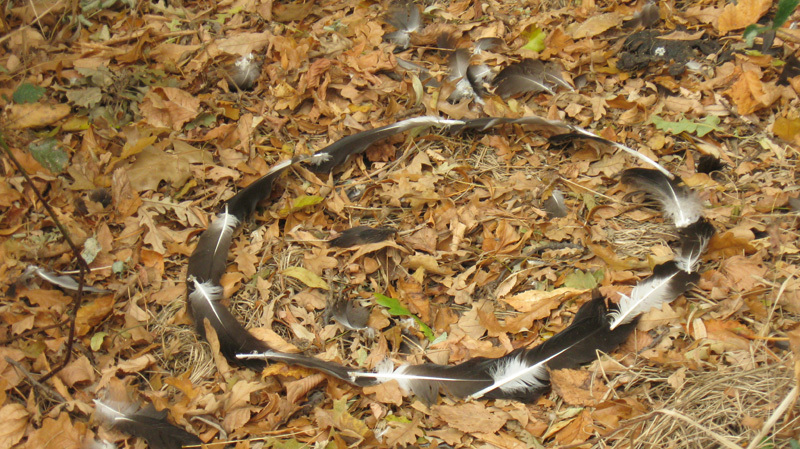 The day remained fairly calm so the circle stayed more or less intact, but the centre had more and more new leaves fall onto it, obscuring the distinction between the inside and the outside over time. I’ve been doing some camping lately. No surprise to anyone who knows me. Thing is, I’ve been camping in some unexpected places. Instead of the usual ‘in the middle of no where’ places out in the mountains, I’ve been becoming more acquainted with some areas on the suburban fringes. Of course there is nothing like camping on your own to promote a bit of philosophical thinking. Something happens to a site when you camp there. That is, something happens to your relationship to it. Camping in a place is like enacting a ritual. You bring your well worn familiar equipment with you, and repeat the familiar actions of setting up camp, preparing meals etc in this new location. 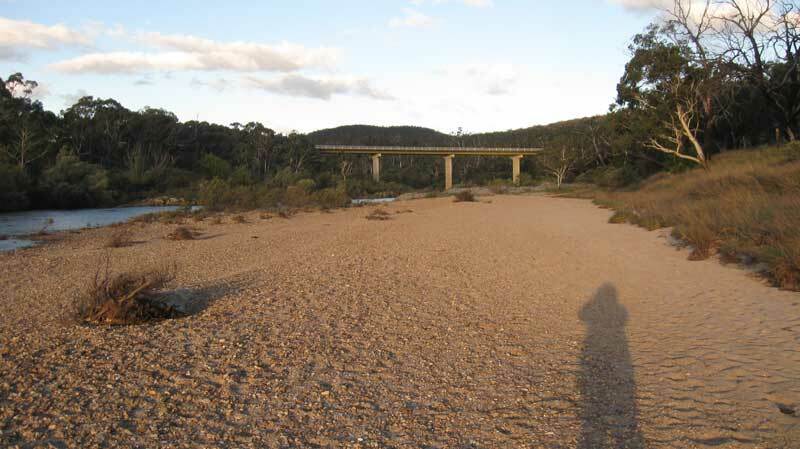 By the time you enact the ritual of repacking to leave, the site has become special to you. It is a site you have occupied, a site that has sheltered you through another night. Your relationship with that site is shared with the other unknown people who have camped there before you, and thus you have some sort of relationship with them also. I want to find a way of incorporating this sense of camping as ritual occupation of space into my creative work. Actually, for some time now I have been photographing my tent every time I camp somewhere, and this has become a sort of ritual recording, but I am thinking of something else – something more real? Well for now this idea remains a work in progress. By the way, the apples were delicious. Happy camping everyone.